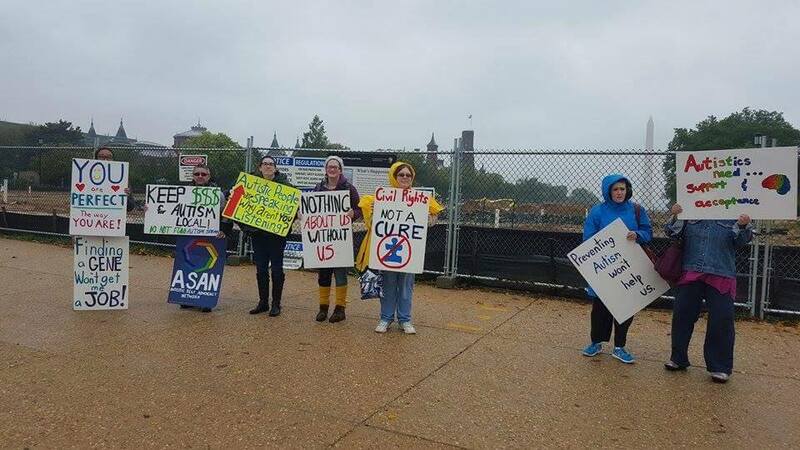 Last weekend, I protested an Autism Speaks rally at the National Mall. A handful of us, mostly Autistic, stood and watched as thousands of people went to raise money for the biggest autism organization in the United States. Upbeat music blared from an enormous stage. Cheerful college students and families with young children packed the sidewalks, despite the dismal weather. 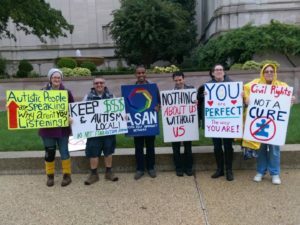 Some people wore homemade t-shirts and hoodies with their autistic relatives’ smiling faces emblazoned across the front. These people are, for the most part, good people. They care about their families. They care about their communities. They love the autistic people in their lives and want to do what they can to make their children’s lives a little easier. Why would anyone want to protest that? These people are good people. The organization they’re walking for? Not so much. The people who donate to Autism Speaks, by and large, don’t know any of this. I spent the majority of the protest talking to people and handing out informational flyers. Almost all of the people I interacted with were shocked at how poorly Autism Speaks serves autistic people. Others were happy to learn why some people don’t like the organization, as they had been curious. A few people brushed us off entirely. We didn’t press them. Most of our group stood silently, occasionally making friendly gestures. Then, the rally organizers called the police. Truly, we are terrifying. Maybe it’s the ponchos? I don’t know what the Autism Speaks organizers told the officers about us. Given the amount of hostility we faced, it probably wasn’t good. 3 armed police officers were sent to deal with 6 people holding damp cardboard signs. They told us to move to a less visible spot across the street. After a quick discussion with Rachel Best, the leader of the Autistic Self Advocacy Network DC chapter, we decided to comply with the officers’ request. We tried to move to a different location with better visibility. We were told to move again. The second time, we were told that if they saw us again, they would arrest us. This was not my first protest. This was, however, different from any other protest I’ve been to. When I marched with Black Lives Matter and Slutwalk, there were hundreds of us. We filled the streets. We obstructed traffic. I felt powerful. I felt like I was making a difference. 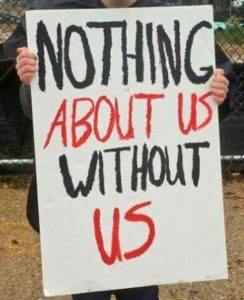 Being one of a handful of protesters standing against an event that attracted thousands was demoralizing. I was happy to spend time with other Autistic people, but I couldn’t help feeling some despair. When there are so many of them and so few of us, how can we change anything? We went to wear our scary ponchos somewhere else. Everyone knows the story of David and Goliath. David, the future king of Israel, takes down Goliath, the powerful champion of the Philistines. Goliath is a little over nine feet tall and is covered in bronze armor. He carries an enormous sword. David spends most of his time taking care of sheep, and is armed with a slingshot. Goliath challenges any of the Israelites to come fight him. David does, and against all odds, David wins. In 2014, Autism Speaks received almost 10 percent less money from donations than they had received the previous year. Steve Silberman, a well-known science writer, has brought criticism of Autism Speaks to the mainstream. 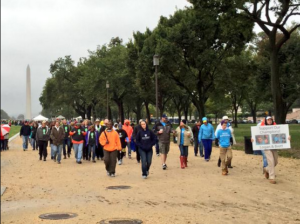 There were, according to Autism Speaks’ own estimate, 2,000 people at their DC rally this year. Last year, there were 8,000. There may have only been a few protesters at the National Mall, but there are thousands more online. Slowly but surely, things are changing. People are beginning to understand what Autism Speaks actually does. I have hope. This is what it’s like to be David and we’re going to win. I am proud of your commitment for change and also for creating awareness!! I did not know this so am grateful for the knowledge! There are a lot of organizations that raise funds under the pretense that they are actually helping those in need. Also in most non profits there are no individuals with special needs hired in any paid positions! Have always been curious how they continue to fool the public all the while most monies go to administrative costs. These are the people drawing the highest wages and out speaking what life with disabilities is all about! How could they possibly know???? Keep up the good work, we need more people like you out there!! Kudos to you my friend! There was another group also demonstrating and strategically placed along the walk route. That may have been us before we were told to move a second time. This, to me, is the most damning criticism (and I don’t hear it emphasized enough). I’ve heard arguments against a cure on principle (e.g. 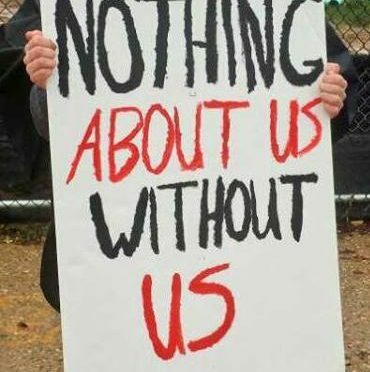 those emphasizing the social model of disability) and arguments that emphasize the “Nothing about us without us” angle, and while I agree with them, I don’t think they’re nearly as knock-down. Like you mentioned, the majority of people supporting AS don’t know or understand where their money is going. They don’t understand what AS really does. Most people want to do good for those they know with autism and feel that they are supporting a good cause. The voice that comes from AS is not a true voice of autism. The voice comes from those who see autism everyday or have it themselves. Supporters of AS want to support autism and AS is right in their face. Just because people were not there with you protesting, doesn’t mean that they don’t stand behind you. Do NOT feel defeated. The internet and social media can have a huge voice. We just need to keep posting information about AS and passing it around it will spread like wildfire and more and more people will start to understand AS and who they are. Love your blog! Thank you.